The Tacoma Program of The Evergreen State College is a full-time course of study at the junior and senior college level. Students do group work and independent projects, taking 16 credits each quarter. A Tacoma Program seminar group discusses The Jungle by Upton Sinclair. The Tacoma Program has an annual theme and common readings among all students. Individual offerings connect to the theme in many ways, covering a variety of academic interests. Subjects to be covered in 2015–16 will include biology, community studies, cultural studies, environmental studies, government, law and public policy, literature, mathematics, political economy, and sociology. Every student participates in the Lyceum, a weekly gathering of all students and faculty. The Lyceum is your opportunity to meet with your advisor and work in small groups on a common academic theme. The Tacoma Program hosts an annual spring community fair. Open to everyone in the community, the fair gives students the opportunity to share their group projects about achievable positive change. Each year, all students take on multi-quarter research projects. You’ll identify a problem, conduct research, and determine strategies to address it. Then you'll present your results at the spring fair. People from the community will see your ideas and may even take on your recommendations. You then take the work you did in your junior year and expand it into your senior year. You’ll develop your own academic pathway to best meet your interests and goals. Like all Evergreen students, students in the Tacoma Program do not select preset majors. Instead, you’ll develop your own academic pathway to best meet your interests and goals. 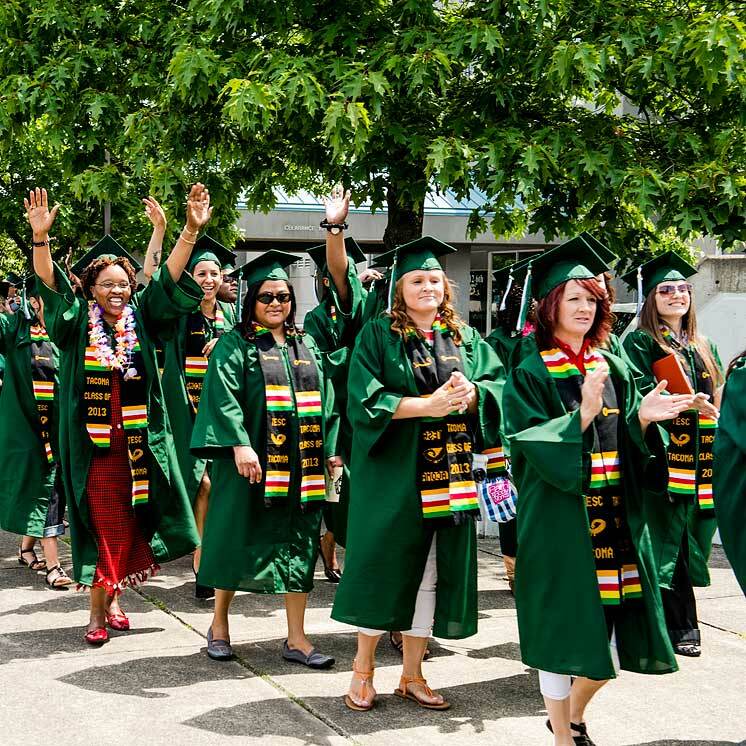 When you graduate from the Tacoma Program at Evergreen, you’ll receive a Bachelor of Arts degree. You’ll work closely with your advisor and other faculty to select the course of study that works for you. Learn more about the faculty in the Tacoma Program.